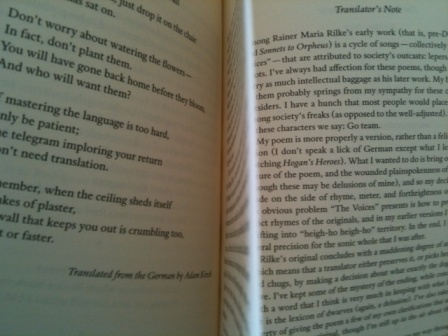 The June 2011 Poetry is the yearly "translation issue," in which a "translator's note" follows each poem. I always thought that to translate you had to speak both languages fluently. But in this issue, Lucia Perillo translates a Rilke poem while freely admitting she doesn't speak "a lick of German." Another translator's note says the translator relied in part on a "literal rendering" by a fluent speaker. This presented some entirely new ideas about what translation means. the binding scent of earth has arisen and lives.